Summer is well and truly here. I haven’t seen our big farm table in weeks. First it was housing the dehydrator, and covered in fruit, and for a couple of weeks now it has been home to the first seedlings of my herb garden. This is what it looks like right now. I didn't even tidy. We hit the jackpot at a local farm, and came away with all of our vegetable seedlings and a really nice start on the seedlings for the culinary herb garden. Why didn’t I start my own this year? Well, I had a little problem with Mothra, and spent planting season cleaning out my studio instead. Regardless, and as is usual, I wound up with what I needed, no matter my original plans. We planted two kinds of tomatoes, both new to us, sweet red peppers, yellow crookneck squash, zucchini, about half a ton of pickling cucumbers, and even managed to put in carrot and onion seeds. It is certainly less variety than last year, but fresh veggies are fresh veggies, and with the amount of food I need to put up, every little bit helps. And the herbs, hooboy. It’s possible I maybe might have kinda gotten carried away. I never do that, you know. We have, sitting on my table, three kinds of thyme (English, French, and lemon), two kinds of sage (regular garden variety, and a very pretty variegated), two kinds of oregano (Greek, and something called “hot and spicy”), rosemary, basil, spearmint, and the find of the decade – chocolate mint. I’m telling you right now, that one is destined for some seriously awesome mojitos. Really. Chocolate mojitos. Epic, right? We also have six unidentified hot peppers (they came as a mix) that I’m not entirely sure what to do with. The veggie beds are full, and last year the ducks ate the hot pepper seedlings right out of their pots! I may end up putting them out on the back porch. I still have the elderberry bush that didn’t get planted last year, as well. So, for my birthday, all four of use spent some serious time and effort pulling out the grass and weeds from the garden beds along the back of the house. It was truly lovely to work together as a family, especially at a project that will feed and take care of us for years to come. However, it must be said that a week later we are still at it. The larger of the two beds is now free of weeds, and is waiting for compost, a layer of newspaper, and a covering of mulch. The newspaper acts as a weed barrier, but unlike the plastic stuff, it rots right into the soil over time. Plus, you know, no plastic leeching into my medicinal herb gardens. That one seems pretty sensible to me. The newspaper is also free, abundant, and a form of composting. This whole process, though time consuming, allows me to look my family in the eye and say, “I know, I know, but I promise, we’ll only have to do this ONCE.” Well… this year, anyway. In the meantime, the seedlings are taking up nearly the entirety of the farm table. So am I looking forward to the imminent unearthing of our table? Not really, no. I hope to get the herbs off it before this weekend, it is true, but mostly because I am expecting another ten or twelve pounds of fruit. I may get lucky and wind up with more. After that, I need to start the seedlings for the medicinal herbs. There really is no other place to put them that will keep them safe from cats, kids, and ducks. Then there is the fact that I have a whole boat-load of stock to make and pressure can. We do this in two huge eighteen quart crock pots. Guess where they are most of the time? And my big nine-tray Excalibur dehydrator? Yup. You guessed it. 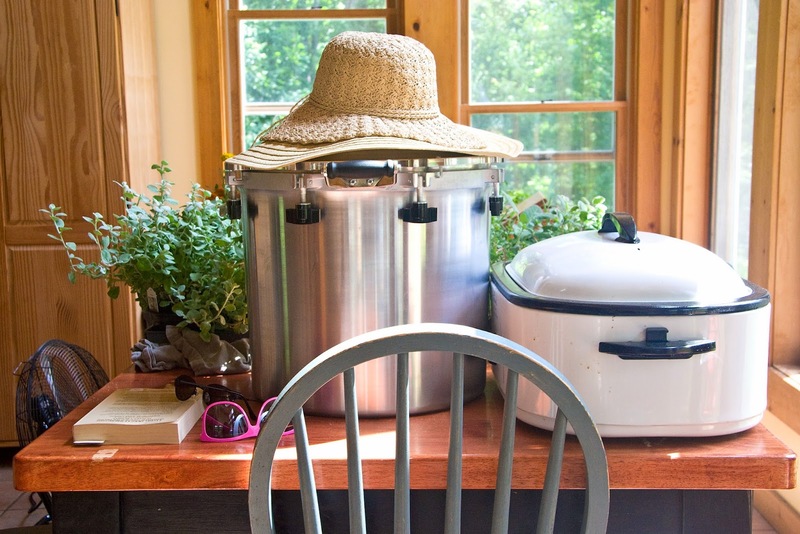 Oh, and did I mention that the pressure canner has to live somewhere in-between uses? I would love for it to get put back into its box, and go back to the basement where it is supposed to live, but when you are using it every weekend, that becomes a bit impractical. So, well, you can imagine where it ends up. In addition, it is the closest flat spot when you come in the back door out of the herb garden. Right at the moment, that makes it the recipient of a stack of sun hats, sunglasses, and dirt-covered work gloves. In my defense, those are at least getting put right back on bodies in a little while when we go out there to finish in the garden. Why isn’t this stuff in the kitchen, where it obviously belongs? Dude. It is already scary in there. There is so much equipment that I am lucky to get six inches of counter space along the front. And we use it ALL. I have a coffee maker, a Kitchenaid stand mixer, my monster food processor, the knife block, one of those eighteen quart crock pots, a compost bin, a duck food bin, the toaster oven, the bread box (which has the empty egg cartons stacked on top of it), and the oils and vinegar we use in cooking every meal. The water bath canner is actually on top of the upper cabinets. No, really. All of the food prep has to be done at the island, because the counters are FULL. Even so, right now the fermentation crock is living there with a new batch of sauerkraut bubbling away, and there is an eighty pound jug of honey on the end near the stove, waiting to be split into smaller jars because it crystalized SOLID in the big one over the winter. Just one more little curveball that spring threw at me this year. The bottom line? My house is NOT tidy in the summer. The dishes get cleaned, the surfaces get washed, and before I can anything, the whole kitchen gets sterilized. Short of that, my kitchen is definitely enter-at-your-own-risk this time of year. There are bound to be at least three recipes running at any given time. Right now, I have the aforementioned sauerkraut, a batch of banana butter in the crock pot, and the honey waiting to be re-melted and put into quart jars. I should also start another batch of beef stock, because the number of bones in the freezer is getting out of hand. Oh, and I probably have a few actual meals to make in there today, too. Where do we eat? Mostly outside on one porch or the other. It’s summer, and beautiful out. Another advantage of this tactic is that I have a lot less cleaning to do. The kids spill the food outside, and the ducks clean it up for me. Bonus. Really, all of this is why I have started calling that particular bit of furniture a farm table. It is not a dining table, mostly because we simply don’t use it for dining during the summer months. It’s constantly full of projects, preserving equipment, fruit waiting its turn, big batches of food in progress, plants, and piles of open cookbooks. Let me tell you, I leave both leaves in it. We need all ninety-six inches. I am very glad of its sturdy construction, three and a half foot width, fifth leg, two inch thick top, and the heavy geared beams that support it. I never have to worry about how much weight I put on it, or where I set things down. It’ll take two or three hundred pounds right in the center over a seam and never give a hint of protest. I bought a table that would last me a lifetime long before I had any inkling what I would be doing with my life. At the time, I thought for sure that it was over-kill, but knew that it was a solid piece that was extremely likely to outlive me. Ten years, hundreds of miles, and thousands of pounds later I believe it more than ever. Of all of the expensive and large pieces of equipment in my kitchen these days, it is the one I use the most, and the one I think about the least. And it sure looks like it, too. Battered, dented, gouged (still no idea how that happened), dotted with permanent marker, and in desperate need of refinishing, it is like a sturdy battle-scarred veteran. Someday I will likely strip the varnish off it, sand it down, and refinish it. I keep meaning to, but honestly there never seems to be a time we can be without it for a few days, let alone the two weeks it would take me to fit it in around my schedule. A few weeks ago, as canning season started to swing into view, and the huge pieces of equipment we use started to come out of the basement and other places where they had been tucked in for the winter, Shawn and I rapidly came to an agreement. We need a summer kitchen. We talked about one last year, but in a decidedly “someday, wouldn’t it be nice” sort of way. This year, we have come to the inescapable conclusion that this is going to be an outbuilding that is necessary for our sanity. My number one concern for this new building? You would think it would be the stove, or the ventilation. Nope. Where on earth am I going to find another table like this??? I can’t function without it. I will not lie, I am giving serious thought to buying another one and putting it in storage until we build, just on the off-chance that they stop making it. I actually went back and checked to make sure that it was still in production. That was the moment I realized what a truly essential piece of equipment my table is. I mean, on how many tables can you lay out flat and sort forty pounds of freshly washed blueberries? It allows six people to work all at once without a bit of crowding. Eight can eat without any trouble, and I can get ten people around it if we are all feeling friendly. A batch of stock alone weighs something in the neighborhood of three hundred pounds – and I never gave it a thought. In fact, I have had a batch of stock running, and hoisted a bleeding kid up on the other end in order to closer inspect a scraped knee. Could I do my job without this table? Yeah, sure I could. But to be honest, I’d rather have the table than my food processor any day, and that really says something. I think sometimes in the exhilarating rush of the new, larger, and technologically advanced gadgets that we fill our lives and especially (for some of us) our kitchens with, we overlook the most important things that allow us to be effective and productive. My table is not fancy. It is not a brand-name product. It did not come from a high-end store. Nowhere is it stamped with Restoration Hardware, or even Pottery Barn. It is not walnut, cherry, or even oak. It didn’t even come pre-finished (although you can order it that way, if you like). But you know what I realized? This is where we gather. This is where we pursue our passions, be they food, art, or even Legos. Shawn even builds his miniature replica medieval siege engines on it. This is where we do everything from the paperwork that runs the house to homework. This one large, sturdy piece of furniture is not just the heart of my kitchen, it is the heart of my whole house. Oh, and if you want a table like mine (and I wouldn’t blame you), you can find it here. Sounds like my house except I only have a kitchen table.